The First Motherboard Supporting 802.11g AP Functions! The ASUS A8V Deluxe is the ideal networking platform for SOHO and homes. Supporting WiFi@HOME, a unique feature found only in ASUS solutions, users can easily establish an 802.11g wireless LAN through a user-friendly, one-touch set up wizard. Also incorporating industry-leading specifications for CPU, memory, system bus, Gigabit LAN and Dual RAID, the A8V Deluxe is excellent for home server applications. Built around the VIA K8T800Pro chipset, the A8V Deluxe harnesses the incomparable power of the AMD Athlon 64FX or Athlon 64 processor to deliver high-performance computing to the world’s most powerful PCs. The Asus A8V Deluxe boasts a wealth of leading-edge features, including support for a HyperTransport system bus of 2000 MT/s, up to an astonishing 4GB of dual-channel system memory, high-resolution graphics via an AGP 8X slot, S/PDIF Out, Dual Serial ATA RAID, IEEE 1394, USB 2.0, 8-channel audio, AMD Cool n’ Quiet Technology and more. The A8V Deluxe is the perfect board for anyone building an extreme system that will easily handle today’s most advanced technology. First AMD64 Chipset with IGP! Abit KV-80! Loaded! Get onboard for Abit�s stunning KV-80! This low-cost, high-performance board is powered by the first chipset for AMD's 64 platform (VIA K8M800) to feature an Integrated Graphics Processor (IGP). The marvelous KV-80 also features an unparalleled range of cutting edge I/O and multimedia features, allowing both consumer and business users to enjoy an exceptional graphics experience while unleashing the full performance potential of the AMD Athlon64?processors. 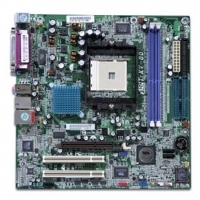 This splendid Socket 754 board supports DDR at 266, 333 and 400 MHz, as well as Integrated UniChrome Pro Graphics with 2D/3D video controller, SATA RAID, onboard LAN, 6-Channel Audio, a wealth of ABIT engineering innovations, and a big array of I/O connectors for great expandability. 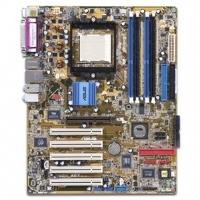 A phenomenal motherboard full of world-class components and features for a price that's simply the best in the world! Read all about it below and click this magnificent motherboard into your shopping cart. For system builders who think they have everythin-the KV-80 is the platform they really need!